imagine you might possibly ever need to use. And better yet, she is so organized, she knows exactly where everything is! :) Anyway, we got together and created these little cork message boards with chip board flowers to decorate them. I gave mine to my niece for her birthday along with a 3M sticky hook to hang it on the wall. That way she can pin her friends school pictures or whatnot on it. 1. Clean up the frame. If there are any rough edges, sand them. 3. Choose your chip board flowers and lay them out on your frame. Take a picture so that after you have covered them in paper you can sort of remember where everything goes and what you had in mind. Even after doing this I still had pieces left over. 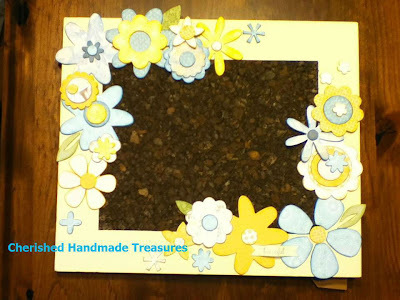 Take each piece to each flower and Mod Podge desired scrapbook paper over the chip board. With your X-acto knife trim off the excess paper. Next--sand, sand, sand the edges. I had a lot of flowers to sand. This is a good job to do while watching T.V. or something. Very boring--but necessary. Once you have the chip boards all ready, glue everything into place following your "template" picture. I decided to keep mine all blues and yellows, but Holly's was very colorful. And although we worked on them together, they each turned out so different. My niece loved it! What a neat craft idea! Thanks for sharing! This is such a cute craft, and definitely something that anyone would be proud to make and display in their home, especially when they get to say "I made that!" when someone compliments them. I kind of love doing that. Thanks! I love to do that too! I'm book-marking this. I want to make it so bad! Thanks, Ashely. If you do make, I would love to see it. I hope you will come back and link it up to the Creative Corner Hop. This is definitely adorable! I love it! This turned out so cute - I need to post mine. Great project - can't wait to try it! Thanks for sharing. SUPER CUTE! Now, I want to make one for myself! Looks great - great turorial! What cute a special board, what fun! What a great gift for your niece:) Thank you for sharing this cute project with Freedom Fridays. Thanks, my niece really liked it. Thanks for the invite and for visiting me. ADORABLE! Thanks for linking up at Doodles & Stitches! Hopping by and following your lovely blog (FB, Twitter, G+ and Pinterest).